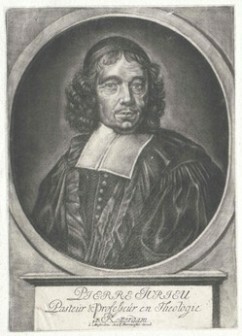 Pierre Jurieu (1637-1713), a French Huguenot leader and grandson of the well-known Huguenot pastor Pierre Du Moulin, lived in extremely testing times. 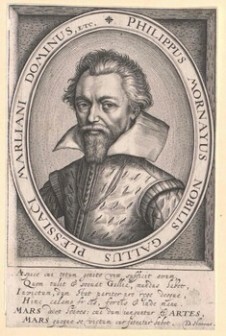 His lifetime was marked by great persecution of Protestants by Catholics in France. 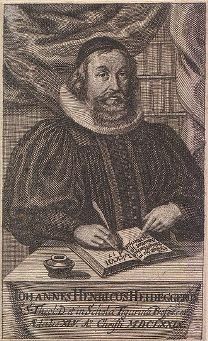 Like many other Huguenots, Jurieu ended up fleeing to the Netherlands, which at the time was a safe haven for Protestants in Europe, settling in Rotterdam, where he became pastor of the Flemish Walloon Church, the French-speaking Reformed Church in the Netherlands. After the revocation of the Edict of Nantes in 1685, Catholic persecution of Protestants in France went rampant. Four years later, in 1689, Jurieu published a work titled Lettres pastorales adressées aux fidèles de France qui gémissent sous la captivité de Babylon (Pastoral Letters addressed to the Faithful of France who are Groaning under the Captivity of Babylon), which was secretly circulated around France and elsewhere in Europe. The main thrust of these letters are an encouragement to Huguenots in France to persevere in the Reformed faith and not go back to the Catholic Church, offering many arguments and reasons not to do so. This was much easier said than done, of course, since their safety would have been secured if they were to return, and there were a host of persuasive polemical arguments from the Papists which convinced many Huguenots to return to the Roman Church. Throughout these letters, Jurieu addresses these polemical arguments, one of which we will consider below. They say, that even though the Church should fall into idolatry, we cannot be saved if we separate from it. And I say, although even the Church of Rome should have reason at the bottom, and were not idolatrous, and that we were out in our separation, we should not hazard our salvation by continuing as we are [i.e. by continuing as Protestants]. Men are everywhere well where they have Christianity and the marrow and substance of it; and it is a folly to imagine that the salvation of men depends upon the temper of their guides. 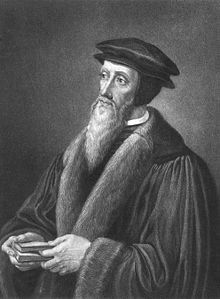 It may be therefore that Luther and Calvin were mistaken, i.e. that the corruption of the Church of Rome was not great enough to oblige the faithful to go out of her: let us suppose that would have done better to leave things as they were, I do nevertheless maintain, that at this day you do not in any way hazard your salvation by continuing where they have placed you [i.e. in the Protestant Church]; because however it may be, you have Christianity in its integrity, you have it wholly pure and incorrupt. In every society where that is found, a man may be saved, after whatever manner it be formed. The idea which men have formed of schism for many ages past is the most false that can be imagined: but besides the falsehood of it, it is the most dangerous and cruel chimera that could be found. Every society would be Catholic Church to the exclusion of all others. The Church of Rome pretends thus far for herself. The Greek Church makes no less pretence thereto. He that goes out of this Church breaks the unity, and he that breaks it is no longer in the Church. Now, he who is no longer in the Church, is no longer in a state and way of salvation, whatever he say and whatever he do. Behold what they say; behold the chimera. 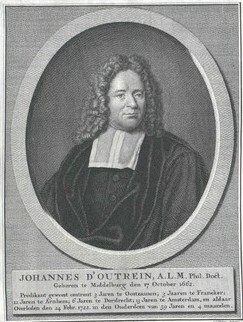 Jurieu argues that the problem with the Papist view of schism is that they confound these two kinds of schism, since they regard particular schisms (such as the Reformation) as universal ones, and hence consider such schismatics as apostates who are altogether excluded from salvation. He would go on to argue that though “peace is to be preferred before division,” nevertheless the separation was made “for reasons of some worth and value, i.e. because of corruption in doctrine and worship,” and since this corruption still persists in the Church of Rome, we therefore cannot return to her. “Man, I confess, has his imperfections; his soul finds itself shut up within a very narrow compass: He sees himself confined on all sides, in the middle of an unlimited extent of space. He finds himself obliged to follow the condition of matter, which is much inferior to him in perfection. He perceived himself miserable and poor in the midst of prosperity and abundance. Nothing fills him; nothing satisfies him: He loathes everything, and desires everything. He is always seeking knowledge, and understands nothing perfectly. He admires, because he is ignorant. He has a curiosity to know, because he knows nothing. He is not only the sport of others, but in some manner his own. Equity and rectitude, with relation to him, are whatever his passions make them to be; and truth is nothing but what pleases him. His imperfections are great, and because they are great, they are not to be met with, but in an excellent being, and therefore serve better than anything else to show the perfection of man. This is what may easily be conceived with a little consideration and reflection upon ourselves. Well, let those spaces be never so great which encompass me, I still find myself greater than they are. My body which is but an atom in comparison to the sun, is a colossus in respect to a mite. The sun which is a prodigious colossus with respect to me, is but an atom compared with that immense space, and those vast spheres wherewith it is itself encompassed. The greatness therefore or smallness of matter, does depend upon different respects, under which it is represented to us, or the different comparisons which may be made of it. It is my soul that makes those comparisons, my soul therefore has something more noble and great in it, than that whose greatness surprised me, or whose minuteness was too exquisite to be perceived by me. Everything keeps its rank in nature; but man, who maintains his rank in the world, and knows it, is more perfect than all other [created] beings; and the narrower the space is which the soul is confined to, the greater subject of wonder is it; since by a particular prodigy, whenever it pleases, it draws together into the compass of an atom, heaven and earth, whatever we see of the immense spaces which encompass us, and all that lies beyond, out of our sight: It runs through all the parts of the universe, without any motion of its own, and that in a more amazing and wonderful manner, than if it moved itself. In the same simple undivided subject, it assembles together past, present, and future things, life and death, light and darkness, the most contrary elements, and most inconsistent qualities: And though it lies concealed, and (as it were) buried in a corner of the universe, it fetches in the universe to itself, when it pleases. It is a surprising thing, I own, to see an intelligence so vast, subject to the laws of such a limited portion of matter, and a being so noble, wedded to the interests of a body which does not seem to have anything in common with it. And in this respect, methinks, it may be said, that it is most surprising to see the soul of man depending on matter, than separated from it; and that our life has something more astonishing in it than our death. For in fine, search as far as you please into the knowledge of the structure and constitution of the body, let the glandula pinealis be the centre of the motion of the animal spirits, or fix it in some other part of the brain; it is impossible there should be any true proportion between the motions of this gland, or this other part of our brain, and the thoughts of our soul; and though we should reason about it for ten thousand ages together, this agreement or proportion could never be found. But is not this dependence of thought upon corporeal motion, and this dependence of corporeal motion upon thought, which are mutual occasions of one another, without any manner of proportion discoverable between them, is not this, I say, another wonder which ought infinitely to astonish us? By this mark, I know that my soul was created: This is the character and seal of its dependence: And that it might appear the free production of an Understanding sovereignly free, it was necessary that this soul should depend upon matter, which is of a nature much inferior to it. Moreover, of all the beings, we behold, man alone perceives his misery and wants; he is therefore the most perfect: For he must needs be of a more noble and exalted nature than other [created] beings, else he could not be miserable, since without knowledge, there can be no misery. Besides, the mere privation of some good, is not properly indigence or want, but the privation of some good that seemed due. Cyrus whilst a shepherd, did not think himself miserable, because he was not seated on the throne: But the same Cyrus knowing himself to be of royal extraction, cannot be content except he reign. What sort of being then is man, who is always poor and miserable, whatever degree of prosperity he enjoys? Why, he must necessarily be such a being whose excellence is no way proportioned to whatever we see. Wherefore the sense of our indigence is one of the greatest marks of our greatness. Both our understanding and our heart, are (I confess) equally insatiable: The one is never tired with knowing, and the other never weary of desiring. But that which occasions their extravagance in that respect, denotes their perfection. The desire of knowledge, shows indeed that man does not know everything; that is, that he is not infinite; but it shows also that he may always be advancing in knowledge, and consequently, that his excellence is not limited in that respect. It is the same case with the desires of man’s heart, which are perpetually renewed, and can never find anything capable of satisfying them. They show indeed that man does not enjoy all that is necessary to make him happy; but at the same time, they discover, that all temporal advantages are incapable of satisfying him; that he is above the world, and all the happiness the world can afford, and that no less than an infinite object is able to fill the vast capacity of his soul. The admiration of the understanding is more wonderful than all he admires, and the desires of man are more noble than all the objects desired by him. That infinite thirst of our understanding tells us, that our excellence is on some sense unlimited; and the infinite appetite of our heart teaches us, that we may aspire to an infinite happiness. What we are ignorant of, humbles us; what we know, satisfies us; and that which we cannot attain to the knowledge of, does in some manner raise us higher than what we do know, and shows us that our soul shall not always continue in that low state it is now in; that it shall not always be taken up with those little interests and advantages, which are all its employs and concerns now, without the power of procuring it any true satisifaction. 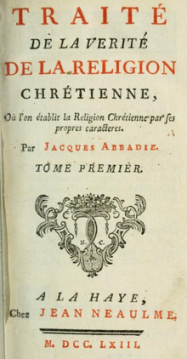 Chapter 18 of De la Verité de la Religion Chrestienne: contre les Athées, Épicuriens, Payens, Juifs, Mahumedistes, et autres Infideles (Of the Truth of the Christian Religion, against Atheists, Epicureans, Paynims, Jews, Muslims, and Other Unbelievers) by the French Huguenot Philippe du Plessis Mornay (1549-1623) contains a discussion of man’s highest end, by no means identical to but reminiscent of Thomas Aquinas’ discussion of the beatific vision. “And what is this faith in God, but a believing that our good lies in him? What is the believing, but the hoping for it? What is hope, but the desiring of it? What is the desire of it, but the not having it? And to be short, what is the continual belief of it here, but [a confirmation] that here we can neither have it nor see it? If we have not faith, what have we but ignorance? And if we have faith, what have we but only a desire and longing, considering that the greater our faith is, the more we despise these base things [of the world], and the greater our desire is, the more we hate ourselves, and the more earnestly do we love God. To be short, what is faith? Salvation promised. But we would [want to] see it. Again, what is faith? The way unto felicity. But we would [want to] possess and enjoy it. Look then what proportion is between that which is present, and that which is to come; such proportion is there between the hope which we have here (yea, even above the world and above ourselves), and the perfect and full fruition of the good which we seek to attain unto. But let us in a few words gather together what we have said heretofore. Whereas we seek for an end or resting-point, the world is made for man, man for the soul, the soul for the mind, the mind for a much higher thing than itself, and what else can that be but God? As for that which we understand here concerning God by our natural wisdom, it is but ignorance; and by our supernatural, is but belief; and belief makes not things perfect, but only moves the understanding. It follows then that our doings can have no end to rest upon here, but only in the life to come, which is the beholding and knowing of God. Again, if we seek the sovereign good, our appetites owe obedience to our will, our will to our reason, and the perfection of our reason is the knowing of God. And so our contentment of our will is our possessing of God. Now we possess not God, but so far as we love him; we love him not but so far as we know him: and neither can ignorance engender full and perfect fruition, but only a certain hope, which hope is accompanied by impatience even in the best of us. It follows therefore that we cannot enjoy our sovereign good, until we have come to our utmost end; nor have our full contentment, until we have full knowledge: that is, we cannot have it in this world, nor in man, which two cannot content the mind or satisfy the will of man, forasmuch as either of them both is a world of wretchedness: but though we have a double life, yet can we have our utmost resting-point and our sovereign good nowhere else but only in God and in the everlasting life. – John Calvin (1509-1564), Institutes of the Christian Religion, III.vi.5. “Question 35. What is now the means by which a sinner becomes partaker in the righteousness of Christ and therefore becomes immediately justified before God? Question 36. But how are we justified by faith? Answer: Not because of the worthiness of our faith, as if God justifies us because of it, as the Remonstrants would have it, and [as if] faith is here reckoned as a virtue and a remarkable good work, and therefore as the meritorious cause of the same [i.e. of justification]. Question 37. Does this [i.e. faith as a meritorious act] not run against Scripture? Answer: Yes, because 1) We are nowhere told that we are justified because of our faith, but rather through and out of faith. Rom 3:30 ‘it is one God, which shall justify the circumcision by faith, and uncircumcision through faith.’ 2) If we are justified because of our faith, how can we then be told that we are justified because of the obedience of Christ and out of grace? 3) That faith here not be reckoned as a work, is apparent because the Scriptures set faith and works against each other. Rom. 4:5. Question 38. How should faith here then be understood? Answer: As a hand or instrument, whereby we grab and take hold of the righteousness of the Redeemer, hence the sayings ‘take hold of God’s strength’ Is. 27:5; ‘receiving Jesus’ Jn. 1:12; ‘receiving the gift of righteousness’ Rom 5:17 and Acts 26:18. Question 39. By which analogy do you clear this up? “Question 11. Where is the true church now to be found? Answer: In the congregation where the marks of the true church are found. Question 12. What are these marks? Answer: Where the pure preaching of God’s word is, and the Sacraments are administered according to the institution of Christ – there is the external (i.e. visible) congregation in which those who believe and are converted constitute the true Church. Question 13. And which is presently this congregation? Question 14. Do you then exclude [those of] other convictions from the true church? Answer: No, if they do not err in essential points, if there is [held among them] the justification of sinners before God, etc. Question 15. What do you hold of the Roman Church? Answer: That it is apostate [‘afvallig’ in the original Dutch] and a multitude of carnal confessors, who make up the beast which we see in Revelation chapter 13, etc. Question 16. Do you then exclude all who belong to the Roman Church from the true Church and hence from salvation? 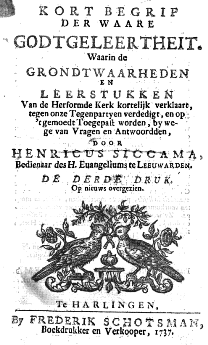 Answer: We would like to hope the best of such who are simple under Popery and trust in Christ and his merit, but those who know the depths of Satan and reject the true doctrine of the reconciliation of sinners to God through the blood of Christ alone, there we cannot see much good of expectation. See Is. 45:22-24; Jer. 17:5. Question 17. If the Reformed Church is the true one, is the true church then entirely new, because where was the church before the Reformation? Answer: The true church was then in the captivity of the Spiritual Babel and was greatly obscured, though at all times there were those who clung to the true doctrine. See Song of Songs 6:10; Rev. 14:6. Question 18. Did our forefathers have reasons to separate themselves from the Roman Church? Answer: Yes indeed, because it was then so bastardized in doctrine and morals that one could not remain in such a depraved Church without running into the greatest danger of his salvation. Question 19. But the Reformed Church is now also much deteriorated; does one for this reason also have no reason to separate oneself from it, as the Labadists do?